Many thanks to John and Matt who attended today’s Wet Flies 101 class. We were blessed with outstanding weather, and the river was in terrific condition: clear, 64 degrees in the upper TMA, and running at just under 400cfs. Although bugs were few and far between, we did find a bunch of fish that were willing to jump on. It’s exciting to witness someone landing their first trout on a wet fly. Well done, gentlemen. A wild brookie that fell to the charms of a Light Cahill winged wet. Been catching more of these gems this year than in recent memory. Friday, I fished the river with friend Jon from 4pm-9pm. We found trout everywhere, first on wets, then on wets and dries. 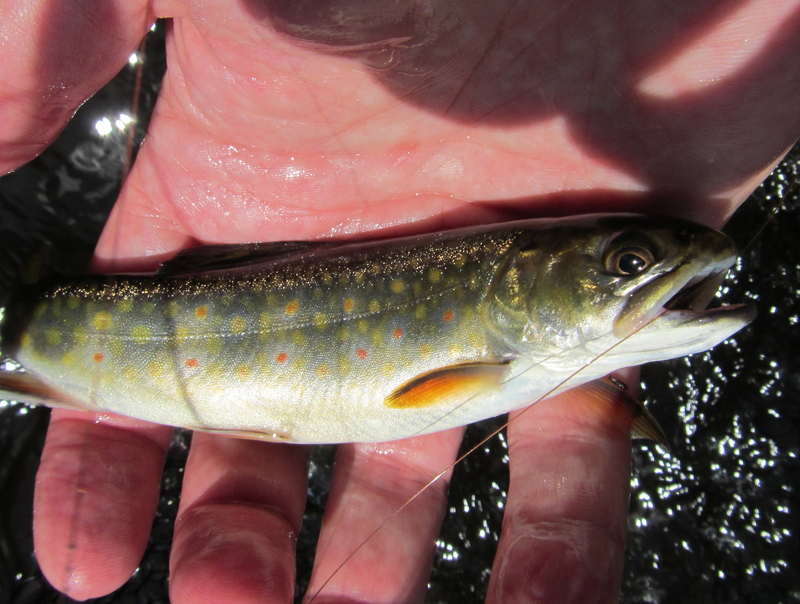 Jon took an assortment of browns and an exquisitely parr-marked wild brookie. He also put on a wet fly clinic, catching two fish in a pod of rising trout in just a few minutes. I, on the other hand, chose to be tortured by trout feeding on emerging Summer Stenos (this hatch has yet to pick up any steam where I’ve been fishing). I spent over an hour stubbornly trying to catch this one fish that was holding hard up against an obstruction — not to mention the triple black diamond current seams I had to mend across. I’d say maybe one in six presentations was good. You can probably still hear the echoes of my hoot when he finally took. I ODed on the Farmington this week, five days on the water. What a way to go. You know all those snotty, pocketed riffles on the Farmington that were impossible for you to fish during the rains and high flows of June and early July? Well, no one else could fish them either. But now you can. And they’re loaded with trout that haven’t seen an artificial fly in weeks. I know, because I waded one of those runs today. In just two hours, idly swinging and dangling wets, I caught over a dozen fish. I fished four flies — a deer hair head/wing soft-hackle, a BH Squirrel and Ginger, a March Brown soft-hackle, and the Drowned Ant — and caught trout on all of them. Regardless of June rains, this time of year is a good time to focus on riffly water. 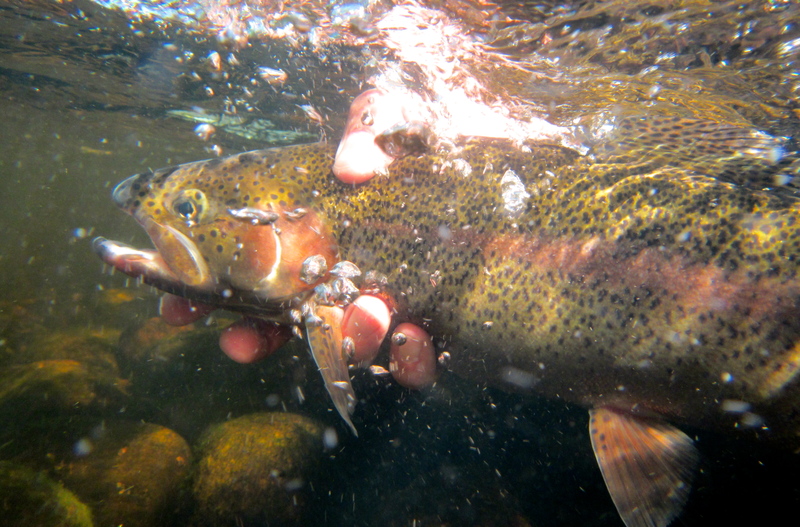 As water temps rise, trout move into these oxygen factories. You’d be surprised at how big some of the fish are, even though the water’s not even knee high. 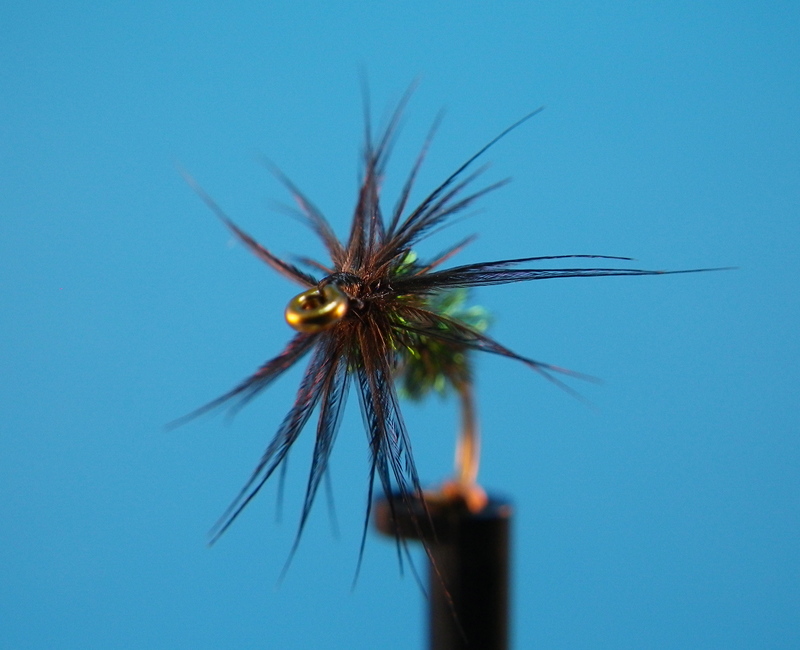 Wet fly, nymphing, even bushy dries like a Stimulator will all take fish. Here are some of today’s customers. Several smaller wild browns like this one. They fight like tigers. 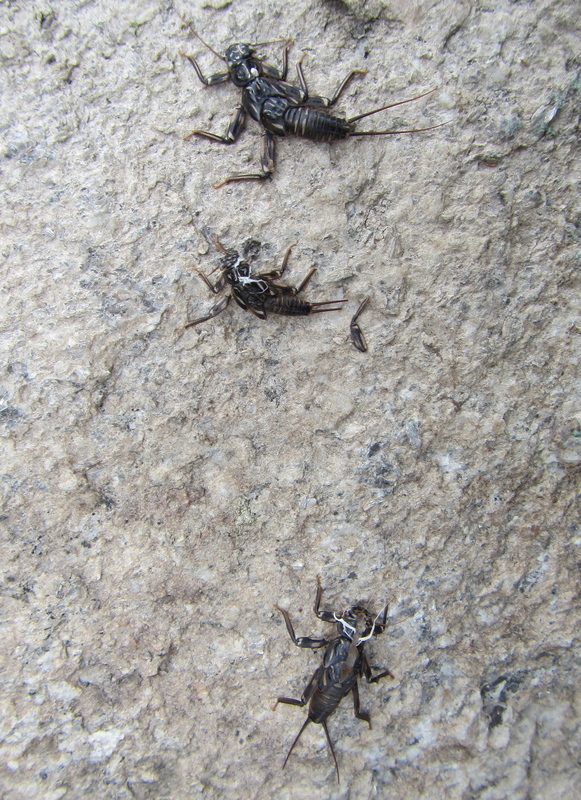 All the really cool stoneflies hang out on this rock to smoke cigarettes and shed their exoskeletons. 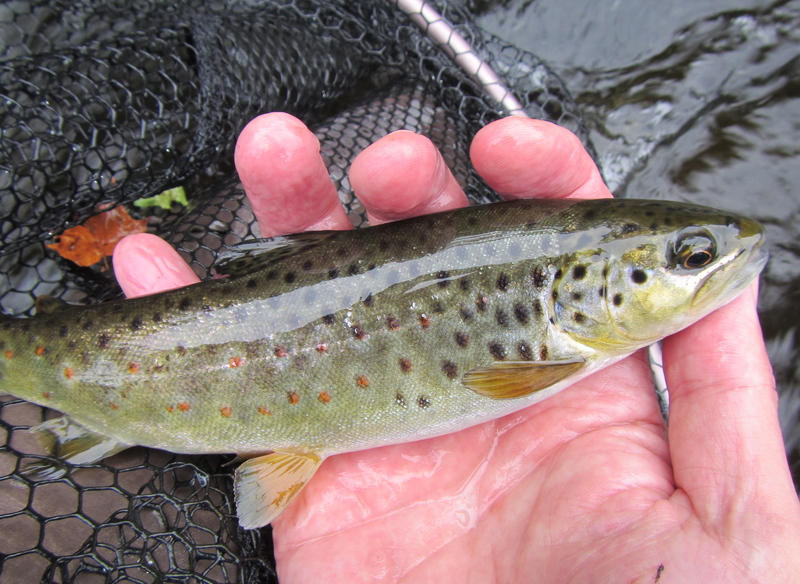 The last fish of the day, taken on a size 12 March Brown soft-hackle. On the Drowned Ant, size 14. 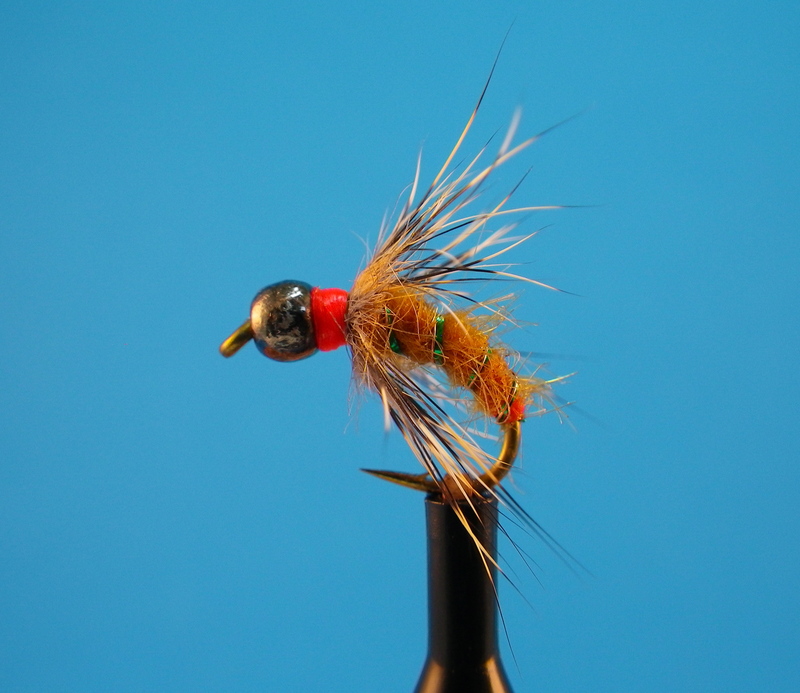 This one had some shoulders, and really clobbered the fly. There are 365 or so days every year when you can fish the Farmington. I manage, on a good year, to do it about 40 times. But of all those days, none is more important than July 21. I’ve made a pilgrimage to the Farmington on that day for four consecutive years now. It’s not by accident. July 21 is the day the Summer Stenos come out. Whether they appear earlier or later isn’t important; the Stenonema have their schedule, and I have mine. There’s a certain place I go to greet them, and since it’s an evening hatch, a certain time I like to be there. Admittedly, I have an unhealthy relationship with Summer Stenos. At times I hold them in starry-eyed adoration. Others, I view them with extreme disgust and intolerance. No other hatch on the Farmington so charms me that I have the date burned into my mental calendar months in advance. No other hatch baffles me with its rise-to-hookup ratio that frequently exceeds 10:1 – even though I’ve found the perfect fly for fooling the trout. On Sunday night I got my first three trout of the year on Summer Stenos. But first, there was some swinging to be done. I hadn’t fished with Jon in almost two months, and for our reunion outing we agreed that wet flies and riffly pocket water were in order. At 630cfs the run was quite wadeable. Jon took the first fish, a smallmouth bass, but after 45 minutes all we had to show for our efforts was a couple of juvenile Atlantic salmon. While it’s nearly impossible to get down on the bite when you’re swinging wets with an old friend on a delightful sunny day in July, I suggested we move to another spot, upstream. I guaranteed Jon he’d catch a trout there. Such predictions are a minefield. I had second thoughts about opening my big mouth from the time we piled into our vehicles until he took his first trout a half-hour later. I was still swinging wets, working below Jon, while he had switched over to short-line nymphing. Just as my three-fly team made the transition from swing to dangle, I felt a herky-jerky tug. The fish made two quick micro-runs, peeling a small amount of line off the reel. I thought nothing of it at the time, as the take came in the heaviest section of current. No need to get this fish on the reel. A big ol’ wild Farmington brown. These fish with a scarcity of spots are intriguing. Check out that tummy. Someone’s been eating well. He took a size 14 Drowned Ant soft-hackle. Each fight has the potential for comedy, drama, or tragedy – sometimes all three – but this one quickly declared itself a drama. The trout is usually a good one when you never see it during the encounter. Big fish have a way of hugging the bottom and using the current against you. By the time I had negotiated the trout into calmer waters, I could see that I had underestimated its size. 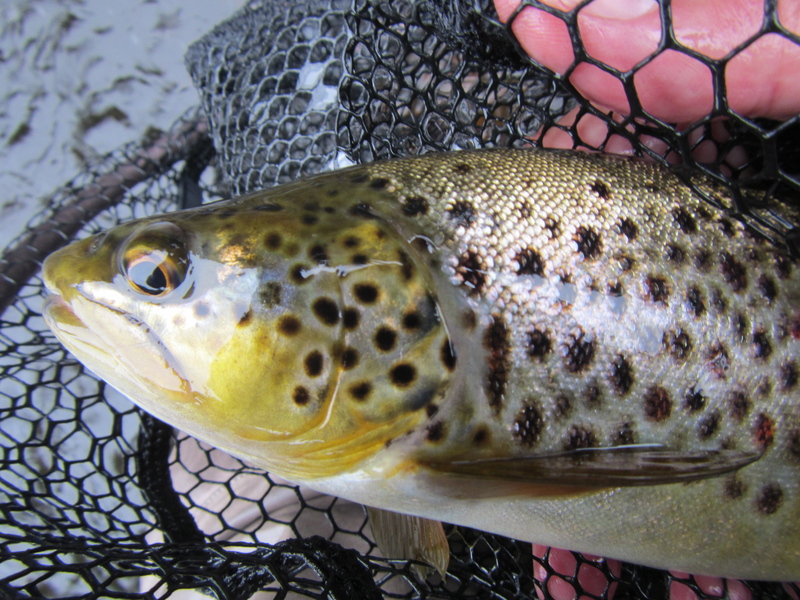 A wild brown with an odd scarcity of spots and, despite his length, only the suggestion of the beginning of a kype. How can you tell that you should buy a lottery ticket that day? You’re just standing in the water, savoring the moment, line dangling harmlessly beneath you, and you hook another trout. Moments later, a Cedar Waxwing lands on your rod as you hold it over the water like some conjurer’s wand. He waits there. Eyeballs you. Looks as if he’s about flee. Then stays long enough for you to call out to your friend to be your witness. This rainbow looks like it’s been in the river a while. Jon took him short-line nymphing not too far from where he was standing. But, lest you think we have forgotten about the Summer Stenos, rest assured. We have not. Shortly before 7pm, we were wading into a pool where friend Todd was already fishing. Jon spotted a trout rising against the far bank. Since I was already rigged for dry, he suggested I have a go at it. As I began my false casting, Jon predicted that I would stick him on the first drift. I was thinking the same thing almost as he said the words. After all, it was a day where I could do no wrong. But, after my sixth cast, we agreed I had most expertly put the trout down. There’s nothing like fly fishing to keep a man grounded. 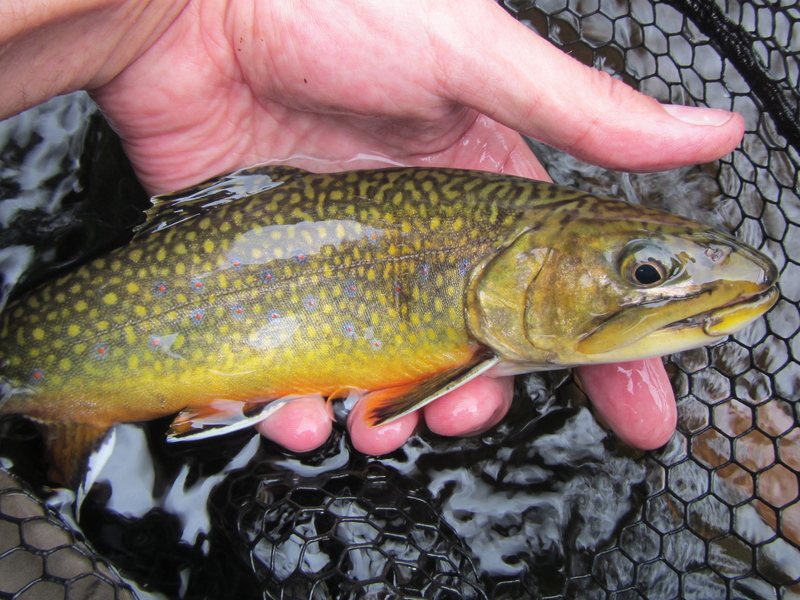 While the hatch hadn’t gained any steam, there were a few trout feeding sporadically on the edge of a pocket. The current seam they were rising in demanded a precision cast perilously close to an obstruction. Then a rapid series of mends to keep the fly from looking like it was on the Scrambler carnival ride. I saw a few size 18 creamy mayflies come off, and switched over to my Pale Watery wingless wet variant that I fish as a dry. With a twelve-foot leader that tapers down to 6x, the line hits the water well before the fly. I was beginning to mend even as the fly was slowly settling onto the surface. I rose trout several times, but came away with nothing but air. Then, in a glassy plate of water three feet from the shore, I saw another active feeder. This trout obliged on the first cast. 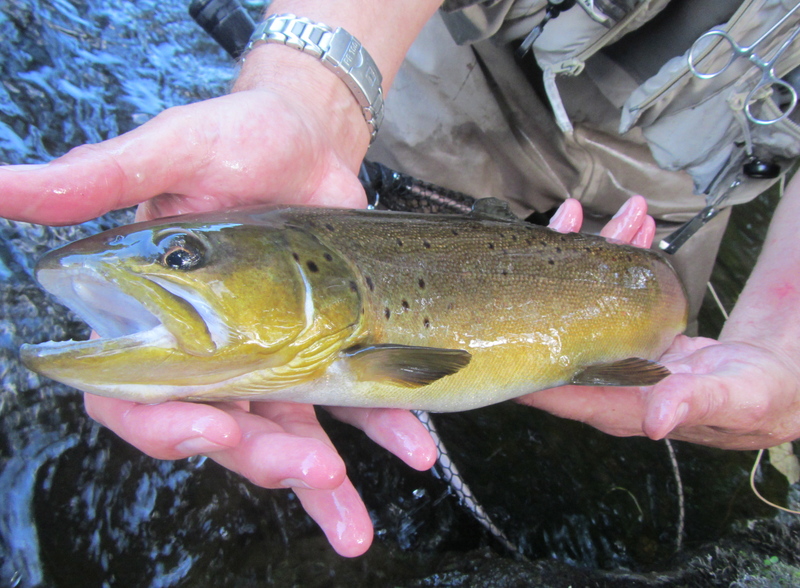 A fine Farmington brown, probably not stocked. My first Summer Steno trout of the year. July 21st. The universe is in balance. A half hour later, another beauty, lower in the pool, again on the first cast. Time races when you’re dry fly fishing. Probably because you’re so keenly attuned to the rhythm of the rises, and the limited opportunities presented by a waning hatch. Evenings, there’s also the looming specter of darkness. Can’t see your fly, can’t dry fly fish. Or at least, not easily. Dusk was just crossing the no-man’s-land into night when I hooked my last trout. I had been repeatedly casting to a small riser – or so I thought. The splashy feeding tells were slight enough to suggest a juvenile salmon. But like that big brown, I underestimated the size of this brute, a well filled out rainbow that ignored several entreaties to come to net. A good day on the river longs for a happy ending. So I am pleased to report that if you leave the Upper TMA, waders off, rod broken down, gear stored, by 9:20, you can make it to Five Guys in Farmington before their 10pm closing. With several minutes to spare. I guided Yoram for a half-day today on the Farmington. Conditions were tough due to the rain. The upper TMA was 790cfs and the color of coffee ice cream. So we headed up to Riverton, where it was a more manageable 350cfs, with only a light stain. We fished streamers and the going was slow. Schizo weather with brilliant sunshine one moment and tropical downpours the next. The last hour, we switched over to wet flies. That got us a few hits and an almost catch, but sadly we were well into overtime for our session. 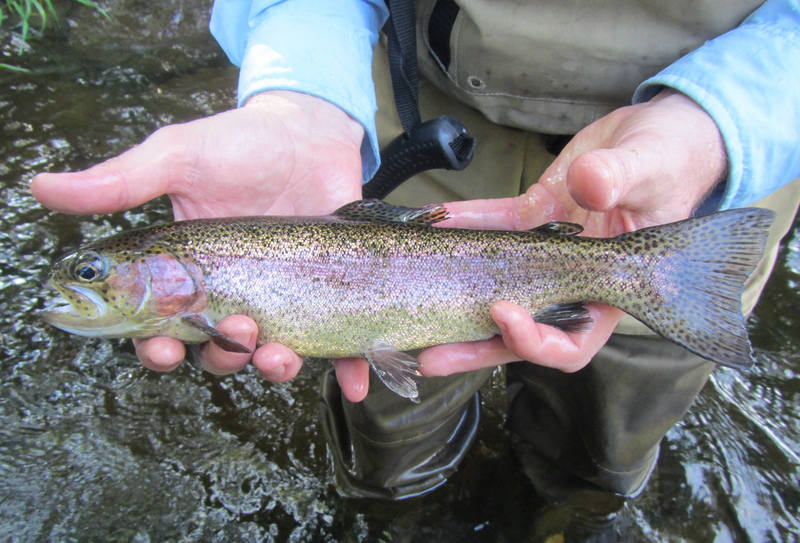 I saw a trout rise along the far bank, and told Yoram he had five casts to catch him. It wasn’t an easy cast to make, cross-river and just beyond the clutches of a fly-eating downed tree, then a quick mend to get a good drift. But Yoram nailed it the first three casts, and on that third cast the surface erupted. Yoram set the hook. And moments later we had a beautiful wild brown to net. He took the Drowned Ant soft-hackle on the top dropper. No picture, as Mr. Brown slipped away during his photo op. But I wanted to give props to Yoram for coming through in the clutch. 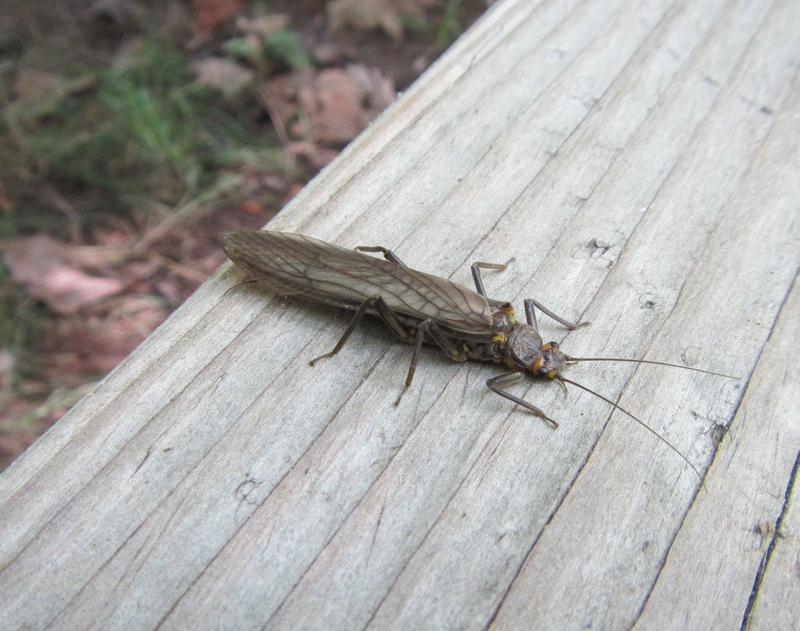 Farmington River 7/19/13: What hatch? With the air temp in the upper 90s and a miserably high dew point, even standing in the brisk waters of the Farmington River offered little relief. Then the sun went below the tree line, and things were quite nice, thank you. I didn’t even need a jacket after dark, despite the cooling effects of some dense fog banks. 5:45pm found me wading a stretch of swift riffles, made all the more challenging by the MDC’s decision to bump the dam release up 125cfs. Along with the Still dump-in, that gave the upper TMA about 575cfs. 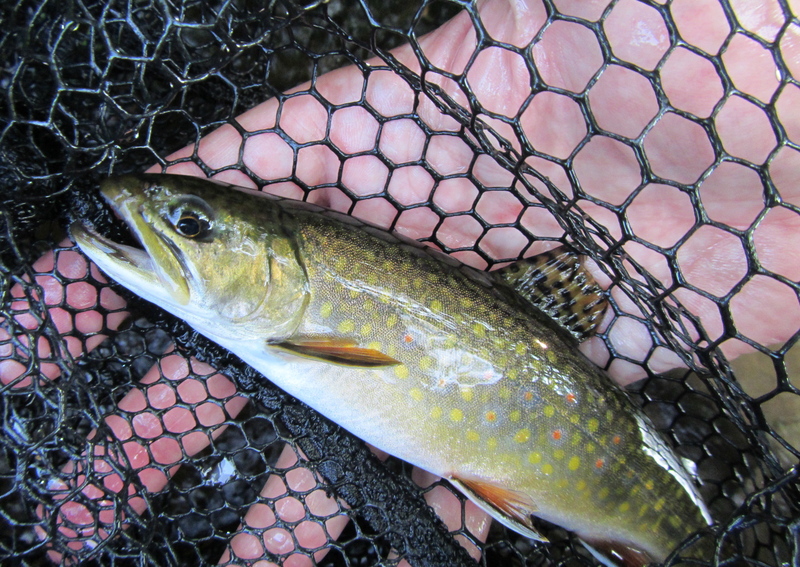 I was swinging a team of three wets, and had several hits before landing a nice wild brookie. A wild Farmington River brook trout. He was feeding right where the main current met the slower water in the shallows. Got him on the dangle on a size 12 March Brown soft-hackle. There were all kinds of birds working over the water, and sure enough there were caddis and sulphurs coming off. Since I had my heart set on some dry fly action, I closed up shop and headed to one of my favorite pools. Sadly, 575cfs is not an ideal height for this spot. Worse, nothing developed hatch-wise. I gave it a good long wait, but by 8:30 I decided to take a walk downriver and see if anything was happening there. I found some smutting trout in a glassy pool about 70 feet out, in water that I could only reach with a shorter cast-and-long-drift-presentation. 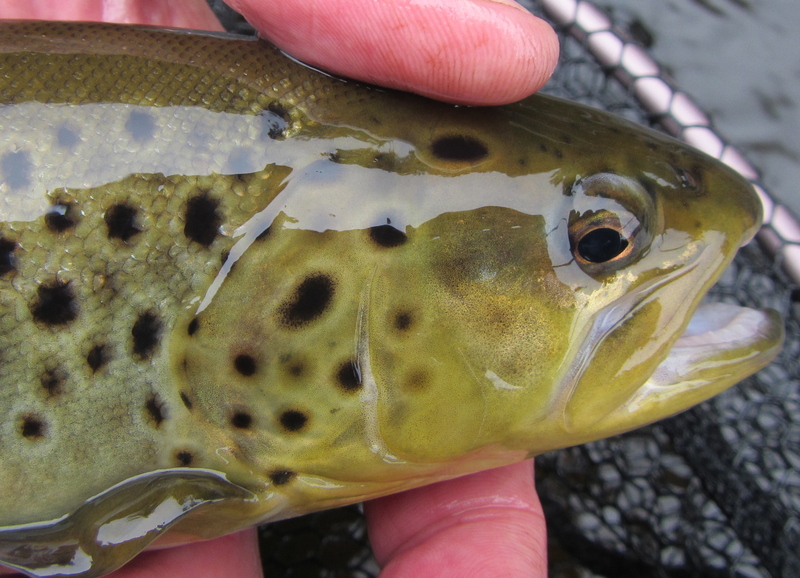 I managed to fool one of them, a densely-spotted wild brown about 10″ long. Sorry, no pic. He give me the slip before I could shoot him. Walked back up to my previous location at 9pm to see if it had begun. It had not. So I packed it in for some night streamer duty. I’ll make quick work of this: fished two long, deep pools. Not a bump. Not a lot of bugs out, either. Usually you can see thousands of spinners in your headlamp beam. Tonight, it was more like dozens. McDonald’s is a poor substitute for Five Guys. But when you’re out close to the witching hour and your stomach’s been howling at the moon for two hours, you take what you can get.